An urgent email came in from Melissa, my husband’s co-worker of nearly 3 decades. Her son Zac had rescued yet another kitten from her husband’s job site and the employees at the company needed help stat. 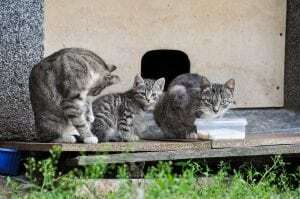 “I can’t stand the thought of so many cats there that keep reproducing and the risks associated with that. Are there any grants or places where we can apply to have the cats altered?” Melissa asked. “Let’s try BARCS Animal Shelter, but first, how many cats are there?” “About 30 -35,” she replied. Gulp. BARCS promptly agreed to help and allowed me to shadow Grace Fellner, their Community Cat Program Manager, on what seemed to be a daunting project. The only problem was that Grace and her trapping assistant, Libby Bartlett, would be leaving BARCS at 5:00 a.m. the following morning. Gulp again. We headed to a bustling industrial complex in South Baltimore near the port, where we met Chris, a manager who has cared for the cats at the 20-acre site for a decade. It was already sweltering, even though the sun was just rising, and it quickly became apparent that these community cats were some of the luckiest in all of Baltimore. As it turns out, Chris had attended a TNR workshop at BARCS back in 2009 with Community Cats Maryland and had already altered 16 cats on the property. He constructed an elaborate feeding station and erected insulated wooden shelters throughout the property. He has been feeding them daily and purchases 30 – 45 pounds of food with his own money every week. When one of the cats suffered a horrific injury, he managed to get the cat to a vet — where his leg had to be amputated — and then adopted him. The company and his co-workers have supported his efforts along the way. At first, I couldn’t understand why Chris didn’t want me to take his photo – or even reveal the name of his employer. “We had a stable colony that more than doubled in the past year,” he explained. 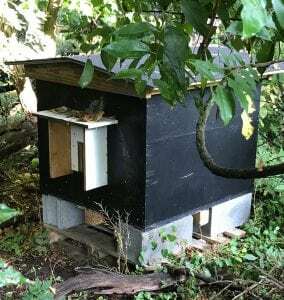 “While cats may wander onto the property, you always worry that people will dump cats, especially if they know the cats are cared for.” It’s a problem every caretaker faces and the reason why colonies must be monitored constantly for new members. After trapping 10 cats, the others went into hiding, as employees started arriving for work. We headed back to the air-conditioned community cat trailer at BARCS, where 39 additional cats were recuperating from surgery they had the day before. I watched as Grace and Libby systematically cleaned all 49 cages and gave fresh food and water to all. By this time, it was 92 degrees outside with 100% humidity and Grace and Libby were planning to return the 39 altered cats to their colonies. The work is physically demanding, but one of the most gratifying in the animal protection field. “What’s your take-away message?” I asked them. “Tell your family, tell your friends, spay/neuter everything. No exceptions.” We have a long way to go, but we are making inroads. Overall, feline euthanasia has dropped 70% at BARCS. 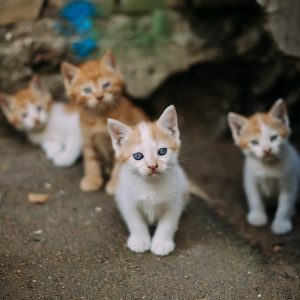 Kittens have benefitted the most, with a whopping 56% reduction, but euthanasia among adult cats has fallen 10% as well. “We also need the community’s help,” Grace noted. “Our program has only 3 employees for a city of 615,000 people.” Thankfully, some people make their jobs easier. The morning’s TNR project wasn’t completed, so Libby and Grace left several traps with Chris, who trapped 4 more cats the following morning. “It appears there are 3 or 4 left that still need to be altered,” he texted me, so he’ll try a third day until 100% are fixed. People often joke about crazy cat ladies, but the sad reality is the world needs more cat guys. There are millions of cats that need homes and even more that need help living on the streets. It’s no secret that our cat guys often get the most attention. We’re proud of our Softies such as John Rallo, who paved the way by showing the world that guys who love cats are grand. And as to Chris, today we annoint you an honorary Softie. We wish we could broadcast your image on a billboard, but respect your decision to remain anonymous. You inspire us and give us hope – we salute you and hope countless others follow your lead. If you are inspired by this story, please consider making a donation to the Amazon Wish List we’ve created to help The Community Cats of South Baltimore.